Here are the deals at Old Navy running 11/25-11/27. 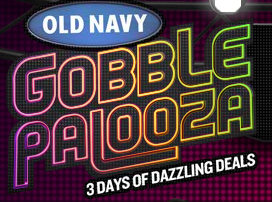 Find more info on the Old Navy Gobble Palooza site here. FREE Xbox Kinect Dance Central w/$25 purchase – extremely limited supply! I’m working hard to round up all of my favorite Black Friday deals for you! View my most recent list of Black Friday deals here.